The Midland Canal Cruise will guarantee you a multifaceted voyage. Adventure, experience of nature, and recreation will all be provided by the specially constructed, homely riverboats which ply the waters of the Midland Canal. The longest artificial waterway in Germany, the Midland Canal, at a length of about 326 km, flows through the states of North Rhine Westphalia, Lower Saxony and Saxony-Anhalt. The best time for a Midland Canal Cruise is between May and September. 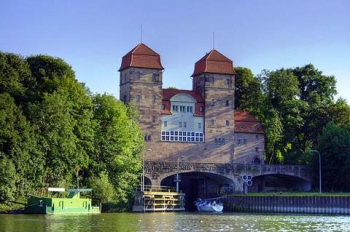 A visit to Osnabrück is on the itinerary of the Midland Canal Cruise. The historic old town with the Town Hall of Westphalian Peace is very much worth seeing. You should also visit the zoological gardens of Osnabrück. If your Midland Canal Cruise should take you to the metropolis of Hanover, you will be able to gain for yourself an impression of the regional capital of Lower Saxony. Numerous green spaces cover about 11 percent of the whole area of the city. Hanover is also interesting from a cultural point of view: the opera house, the Market Church, and the museum of Lower Saxony are just some of the attractions of the city, which are almost too numerous to count. In Brunswick with its landmark Lion, you will have the opportunity to visit the castle of Dankwarderode, an experience which will transport you back into the Middle Ages. The imposing Brunswick Castle also lends the city a quite particular charm. Picturesque Magdeburg is home to another work by the artist Friedensreich Hundertwasser, the Green Citadel. The Monastery of Our Lady is one of the most significant Romanesque structures in Germany and is to be found very close to the cathedral and the city centre. Interesting cities, historic monuments and expansive landscapes await you on a Midland Canal Cruise in the beautiful north of Germany.